We are eMediaTV – a small group of teenagers who love spending their time in the gaming world! Most of the gamers between 13 and 16 years of age usually are being reproached because of their age. Our purpose is to show people that not age but effort and hard work are those that matter. Our second aim is to develop Bulgarian gaming community. Most of the people consider gamers “zombies”. We want to prove them wrong! We would like to show how good friendships could be made throughout Gaming. Most importantly – we want to show that gamers are socially responsible! All the profit from the tickets will be spent in support of T.R.A.P. – Trotoara Room for Angry People and Тротоара foundation that stands for creating a better social environment for the young people in Bulgaria. 12 hours of gaming – live! 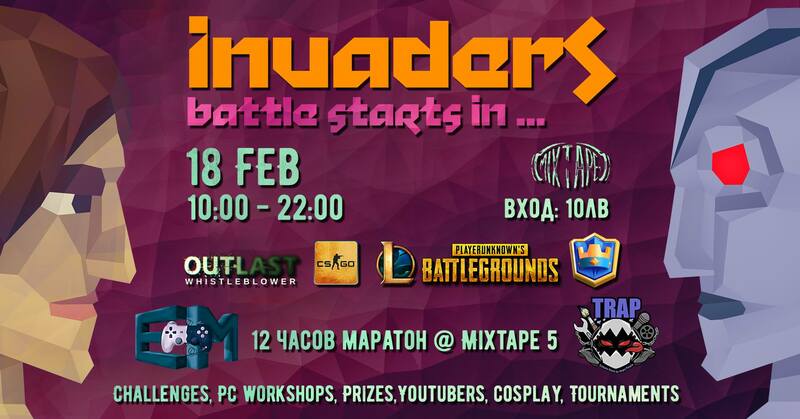 Tournaments, prizes, cosplay, challenges and many more! We will present you software, hardware, PC maintenance advice! CS:GO, League of legends, Clash Royale, PUBG, Outlast and many more! You will meet your favorite Youtubers! We will start at 10:00 and the event worn’ts stop until 22:00! You are always welcome to meet us, have fun together and support a wonderful couse!